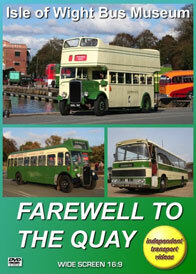 The Isle of Wight Bus Museum was established in 1997 in their home on the Quay in Newport, Isle of Wight. The Quay has been the venue for many events put on by the Museum, mostly in the form of the Spring and Autumn Running Days. The spring event usually just features preserved buses that have had Isle of Wight connections, the autumn event caters for all buses including buses and coaches from the mainland. Easter 2015 became a big event in the life of the museum as it opened its doors to a completely new museum situated in the former Southern Vectis bus depot in Ryde. The depot, purposely built for Southern Vectis in the 1930s is an ideal place to show off the exhibits and to welcome visiting buses and coaches at the many events planned for the future. This video programme is a fitting tribute to the old venue as we take a look at some of the events that have taken place between 2011 and the final Autumn Running Day in October 2014. Our cameras have made a number of programmes in the past, the first one in 1998, and are still available. However none of the footage on this programme has been seen before, so sit back and enjoy your journey to the ‘Island’. Our journey does indeed begin on board a Wilts & Dorset Bristol VR, 4413 (BFX 666T) as we head from the ferry at Yarmouth to the Quay to attend the 2011 Autumn Running Day where a good deal of action can be enjoyed. Our next visit is only brief, this time at the 2012 Running Day to observe a number of Bristol K and L types ‘on parade’. In April 2013 our cameras were invited to go out for a ride on board preserved flat screen Bristol VRT series 2, fleet number 628 (SDL 638J). We visit Godshill and see a number of the exhibits at the museum being moved around for 628 to be released for the outing! We now come to the final year of the museum on the Quay - 2014, starting with the Spring Running Day with plenty of ‘Island’ buses moving about. This includes Bristol K5G, 721 (EDL 657) currently being restored, and looking superb. We take a ride to the Isle of Wight Steam Railway at Havenstreet on board the rare Duple bodied Bristol RESL, 301 (KDL 885F) and then return to the Quay for more action. The final section of this programme features the Autumn Running Day where most of the action is captured on the Quay as the buses and coaches arrive and depart for services covering most of the island. This final running day formed part of the ‘Isle of Wight Beer & Buses Weekend’, which involved CAMRA (Campaign for Real Ale) and was a complete success. We take a ride out on Bristol FS, 570 (YDL 315) to one of the pubs, and return to the Quay for the final departures of the weekend. Our future programmes from the Isle of Wight Bus Museum will be filmed at the new museum location of which is; The Bus Depot, Park Road, RYDE, Isle of Wight, PO33 2BE. See you there! Duration : 57 minutes (approx).